College is challenging at times for all students, but for introverts, it can be especially difficult. While more outgoing students can easily make friends and navigate their way through crowded classes and social events, introverts may often feel uncomfortable and left out. But it doesn't have to be that way. In this guide, we provide information to help introverts have a fulfilling college experience, while still embracing their introversion and getting the solitude they need. Many people think of an introvert as a shy loner who hates being around other people. However, this is not the case at all. Introverts can enjoy being with others just as much as extroverts, but they need to do it in smaller doses. This is because introverts are drained by social interactions -- and can become overstimulated by the dopamine increase in the brain associated with socializing -- while extroverts are energized by them. As a result, people with an introverted temperament need quiet time alone in order to recharge their batteries and feel healthy and happy. In addition, people who are introverted tend to prefer having a small group of people in their lives that they have close relationships with, rather than a larger social circle. Although everyone is different, there are some common characteristics that are associated with introversion. People who are wondering whether or not they are an introvert should answer the following questions in order to figure it out. Do you enjoy interests and hobbies that you can do on your own? Do you feel tired after social activities? Do you prefer working alone? Do you dislike small talk? Do you feel alone in crowds and find them stressful? Do you strongly dislike being the center of attention? Are you a good listener? Do you prefer having a small group of close friends? Do you prefer written communication over verbal communication? Do you have a constant inner monologue going on in your mind? If more than five of these statements apply to you, you likely have introvert characteristics. For introverts, it can be especially difficult to navigate the college experience while fulfilling their need for solitude and quiet. The following are some tips to help introverts deal with this challenge. Joining clubs is a great way for introverts to pursue their interests and meet people who they already have something in common with. Students who don’t feel comfortable speaking to people they don’t know go into each conversation with something to talk about, which can make it easier to get to know their peers in the group. The availability of online classes makes it easier for students to complete their degrees while staying within their comfort zone. Even those who do not enroll in an online program can take some online classes, which can help introverts get some respite from dealing with the in-person classroom experience. Sit in the front of the classroom. Large classes, especially the ones held in lecture halls, can make introverted students feel uncomfortable, so in order to combat this, they can sit as close to the front of the room as possible. This way, they don’t have as many people coming between them and the instructor, which can make it easier to concentrate. Seek out activities that attract extroverts. Just as it’s helpful for introverts to befriend extroverted people, they should also be sure to connect with introverted peers. Since many extroverts don’t understand the temperament of introverts, it’s important for them to seek out people who appreciate their quiet disposition. Meeting new people can be challenging for introverts, but they can begin by building connections with people they’re already somewhat familiar with. Whether it’s someone that sits near them in class or a friend of their roommate, striking up friendships with people they already feel comfortable around can help them build their social circle. Avoid peak dining hall times. During peak hours, introverts may find dining halls to be too crowded for comfort. On days they don’t want to deal with being surrounded by a lot of other students, they can plan to have their meals before the rush when the dining hall first opens, or wait until the crowd has thinned when it’s closer to closing time. Remember there is nothing wrong with being introverted. What are the differences between an introvert and an extrovert? McBain: Introverts get their energy from being alone or in small groups, whereas extroverts are energized being in big groups or by being around a lot of people. There’s also a new terms that being used called “ambiverts” which are people who have characteristics of both introverts and extroverts. Klein: Introverts tend to get their supply of energy from being alone; the more introverted one is, the more likely they are to be overwhelmed by constant stimulation, lots of people around, etc. Extroverts thrive on those things and find being alone painful; the more extroverted, the more likely they are to be under stimulated. Smith: Introversion and extroversion are one dimension of Jungian personality characteristics. The major difference between introverts and extroverts is where they focus their attention and how they re-energize themselves. Essentially, where a person falls on this continuum is a reflection of their orientation towards life in general. Introverts are focused on the inner world and prefer communicating one-on-one or in writing. In contrast, extroverts are focused on the outer world and prefer communicating verbally in groups. An introvert learns best through reflection, while an extrovert prefers experiential learning activities. Typically, an introvert will think about a situation before acting. An extrovert might act first then later think about his or her actions. Introverts are known to be private and reserved. In comparison, extroverts are thought to be outgoing and social. As a result, after a long week, an introvert may prefer going to a movie with a small group of friends for fun. The extrovert might prefer attending a large party or concert. What are some common misconceptions people have about introverts? McBain: That they are antisocial. It’s not that they don’t like to socialize, it’s that too much time around a lot of people can be very draining for them. So, if you’re introverted, you may have to spend time explaining to others and educating them on who you really are not their perception of introverts in general. Klein: People often think introverts have social anxiety or are shy. While there may be some overlap (if you need to be alone more, you may not develop social comfort as easily), these are two very distinct traits and behaviors. It is best to think of introversion as about where you get energy from…not about fear or a problem. People also think introverts aren’t good leaders. In fact, there is hard data to support that some of our most powerful leaders have a strong introverted nature. Spending quiet time by oneself or in small groups can lead to innovation, unique thinking, and problem-solving that doesn’t happen when “groupthink” is going on. The introverted leader may not seem introverted when they are in front of a group, but some of the best public speakers are introverts. They just aren’t the kind of public speaker that wants to speak for three hours, and then spend the rest of the day talking to their audience. It is especially tiring. Smith: Often, the most common misconception about an introvert is that he or she is shy or not social. As well, introverts are often typecasted as quiet and uninterested, when they may just need time to reflect upon or process an issue. What can extroverts in college do to better understand their introverted friends? McBain: Keep in mind that your introverted friends will probably want to leave big social gatherings earlier than you’re ready to leave them. So try to be sensitive to their needs while also getting your own needs met. You might need to compromise in that they maybe stay out a little later than they would like and you leave a little earlier than you would like. Klein: If you consider yourself extroverted and have a friend who you don’t quite “get” or who seems to be spending a lot of time alone, do some research on introversion. Know that it’s not you they are avoiding, it’s overstimulation and the need to re-energize. Extroverts also can help by giving their introverted friends “easy outs”: ask them if they are “up for going out” and give them permission to stay in or to skip a big gathering in favor of a smaller gathering. Try to bend and flex and, even though you may think nothing is better than meeting or being around lots of new people, your friends aren’t wired that way and, as a result, may place less value on that than you do. Try not to take it personally. Smith: It is important for both extroverts and introverts to understand the various preferences of each. Again, it doesn’t mean that one cannot do the other behavior or attribute. Introversion and extroversion are each preferences. For example, while an introvert may not prefer to speak in groups, it doesn’t mean the introvert cannot do this. With that said, an extrovert can get to know an introvert better by spending individual quality time with this person. Communicate individually with an introvert and ask questions that encourage the introvert to respond with what he or she may think about a topic. Remember to give the introvert time to think before responding. Do not interject immediately after asking an introvert a question. What are the most important things introverts should know about navigating their way through an extroverted world? McBain: That their wants and needs are just as valid and important as their introverted counterparts. It’s simply where you get your energy from in the world, being alone or being a in group of people. Klein: That’s the million dollar question. If I had to pick one piece of advice, it’s try to remember that the west is very extroverted. It has been shown that kids in the west value and gravitate towards those other kids at school who are loud, entertaining, and boisterous, whereas in the east, the more studious and thoughtful, the more respect kids earn from each other. I’ve worked with extroverts from Asia who come to the United States and realize “they are finally home” and introverts from here who go to Asia and feel much more comfortable. Though that is a generalization, there is an important truth within that. Smith: First and foremost, it is important for introverts to realize that the college environment is structured around many social features and often promotes experiential learning activities. As well, a majority of people identify as extroverts. To be successful, an introvert should recognize how he or she learns best and become aware of their comfort level when relating to the outside world. If possible, try to maximize learning strategies that you are comfortable with and/or prefer. An introvert should spend some time considering what activities or tasks are best for their individual learning style; thinking about the environmental conditions where he or she studies best. Similarly, find social outlets that are a good fit for your individual needs. Juhi Kore is an introvert who studied political science at the University of Tampa. In order to provide introverted college students with advice from someone who has first-hand knowledge of what they’re going through, we asked her to share her experiences below. What was your experience like as an introvert in college? My favorite definition of the word introvert was one I learned in my leadership class: someone who gets their energy from within versus from other people. I get my energy from creating positive impact and empowering those around me. I light up when I see other people lit up with curiosity, happiness, and love. So as an introvert, whenever I am adding value to other people’s lives, I feel comfortable being around them. However, I had situations, especially early on (especially with my fellow freshmen), when I felt isolated from some of my friends because I never enjoyed going out to clubs. The prevalent culture among freshmen at most American universities is that of clubbing and mine was no different. I definitely felt peer pressured into going out a couple of times, but I did not enjoy myself and finally decided that I was not going to sacrifice my happiness to make other people happy. It was hard at first for my friends to understand that at night time, I was peopled out and all I wanted to do was recharge so I could be happy around people the next day, but they finally came around. As an introvert, did you feel misunderstood by other students? I was not shy or quiet or almost any of the qualities more traditionally associated with introversion. Knowing that I was the most involved student on campus along with my penchant for public speaking, it was very hard for other people to entertain the idea that I could be an introvert. This would often result in me having to explain to my peers that my lack of sociability at 10 p.m. was not a reflection of how I felt about them; it was just me being drained after a long day of being around people. Another element of this was me having to cancel plans with friends because I just could not get through being around more people. And while I did feel bad about having to cancel on my friends, some days that was easier to do than to get out of bed, get dressed, and endure hours of being around other people. How were you able to build a social life for yourself as an introvert? I got extremely involved with different organizations. This again, was way easier for me to do than look for friends in other places because of the impact factor. I joined organizations that I knew I could learn something from and where I could impact people in a meaningful way. In a way, it was a vetting process of sorts because I already had something in common (the organization and the mission behind it) with those people and did not have to make small talk. Almost all my friends at university were people I had met through my involvement. I would have the occasional cafeteria friend but that was rather uncommon. Additionally, my definition of a social life in college was mostly having people to eat my meals with or hang out with over the weekends. I wasn’t a big partier, so I was not really ever looking for friends to hit the clubs with. I really do think that the most important way that I was able to have a social life as an introvert though, was by ensuring I was making enough time for myself. By scheduling one-on-one time with Juhi on a daily basis, I was able to recuperate from my people-induced exhaustion and be at 100 percent the next day, every day. What advice would you give to introverted college students who are surrounded by extroverted peers? It is okay to leave. I say this because I know I needed to hear that as a student. Oftentimes, I’d find myself sticking around at events because nobody else had started leaving. It doesn’t matter! If you are tired and peopled out, it is better for you to leave instead of staying and not enjoying yourself. There’s also that feeling that you may be disappointing your friends or peers but trust me, your real friends would rather have you feel comfortable than not. Thankfully, I was able to do more of that as a senior but nobody, regardless of their class standing, should feel obligated to hang around people. I understand the whole FOMO thing too but self-care is more important than any fear you may have of missing out on something crazy. If you do not put yourself first and ensure you are at your 100 percent, you cannot give anything to other people or the world. It is important for you to be full before you can give to other causes. Personality can affect every part of people's lives, so it's important for introverts to understand their quiet nature in order to thrive in an extroverted world. These resources are a diverse look at introversion that college students can use to succeed inside and outside of the classroom. 10 Things Introverts Need in a Relationship: People who are dating an introvert can use this video to better understand their partner. 12 Things Introverts Are Best At Doing: The strengths of introverted people are outlined in this video. Are You An Introvert? Signs and Traits of Introversion and How To Be Better Socially: This video discusses what an introvert is and why it's not a negative thing. Are You Shy or Introverted? Science Says This Is the Difference Between Them: This article provides a look at the differences between introversion and shyness. Introversion Is Not A Weakness, So Why Are You Treating It Like One? : Workplace expert Heather R. Huhman discusses introverts in the workplace in this article. Introversion - Psychology Today: This page on Psychology Today's website features articles about introverts. Introvert - Udemy: This page includes classes from Udemy about introversion. Quiet: The Power of Introverts with Susan Cain: Although this podcast is geared toward the parents of introverted children, college students can learn a lot about introversion by listening to it. Topics covered include the neuroscience of introversion, self-esteem, and how participation requirements affect introverts in the classroom. The Creative Introvert Podcast: Introverts who enjoy creative activities can find out about how to increase their confidence, battle burnout, and stop procrastinating through this podcast. The Intronaut - A Podcast for Introverts: The Intronaut provides encouragement to introverts by discussing topics like self-awareness, fear of public speaking, and learning styles. The Introvert, Dear Podcast: In this podcast, hosts Jenn Granneman and Bo Miller provide advice to introverts. Some topics include romantic relationships, self-care, creativity, and travel. The power of introverts: This TEDTalk video discusses the challenges introverts face and why they should be celebrated. The Spectrum From Introversion to Extroversion: This article explains introversion and extroversion according to the Myers-Briggs Personality Inventory. What Kind of Introvert Are You? : Readers can learn about the different types of introverts by reading this article. Will the Real Introverts Please Stand Up? : In this article, Scientific American explores the signs of introversion and the difference between introverts and extroverts. Heidi McBain is a Texas licensed marriage and family therapist, licensed professional counselor, and registered play therapist. She specializes in women’s issues, grief and loss, and maternal mental health. She also offers online video counseling to women living throughout the state of Texas. In addition, she’s a published author, blogger, and speaker. Michael Klein has been a workplace consultant and advisor to individuals and organizations for over 20 years. He has provided services to industries including pharmaceuticals, insurance, entertainment, banking, construction, education, forestry, retail, publishing, hospitality, manufacturing, and health care. He partners regularly with attorneys, accountants, and other professional advisors. Dr. Klein helps businesses select and develop their leaders, as well as grow trusting and collaborative teams and workplaces. He has created and managed development processes for executives, sales leaders and professionals, as well as front-line managers and various professionals. Michael advises individuals on issues related to professional development and emotional intelligence. His book, Trapped in the Family Business, addresses many of the complexities of entering, working in, and exiting family businesses. His book and work have been featured in numerous publications including The New York Times and USA Today. Scott Smith, PhD, joined Barry University in 2011 as the Vice President for Student Affairs and assumed the role of Vice President for Mission and Student Engagement in 2018. In this role, he serves on the University’s executive leadership team and is responsible for all areas of university mission and student engagement. University mission includes campus ministry, ethical leadership and mission engagement. Units in student engagement include career development, commencement, counseling and psychological services, dean of students, dining services, disability services, first-year experience and new student programs, housing and residence life, international and multicultural programs, orientation, public safety, student conduct, student health center, student life, student union, and the University bookstore. He has more than 25 years of experience in higher education leadership, having previously served at Saint Louis University, Seattle University, Ohio Northern University, and Marquette University. Smith received his BA in Psychology from The University of the South in 1989, a master’s degree in adult and community college education and counselor education from North Carolina State University, and a PhD in Higher Education Administration from The Ohio State University. Juhi Kore is a speaker, entrepreneur, and researcher who is a strong advocate for many different social, economic, political, and psychological causes. She is also the author of You Got This: How to Win at College, the most comprehensive guide to succeeding at U.S. universities. Juhi's work focuses on community building in the impact space and she works with students and entrepreneurs from all over the world to help them pursue their impact journeys. 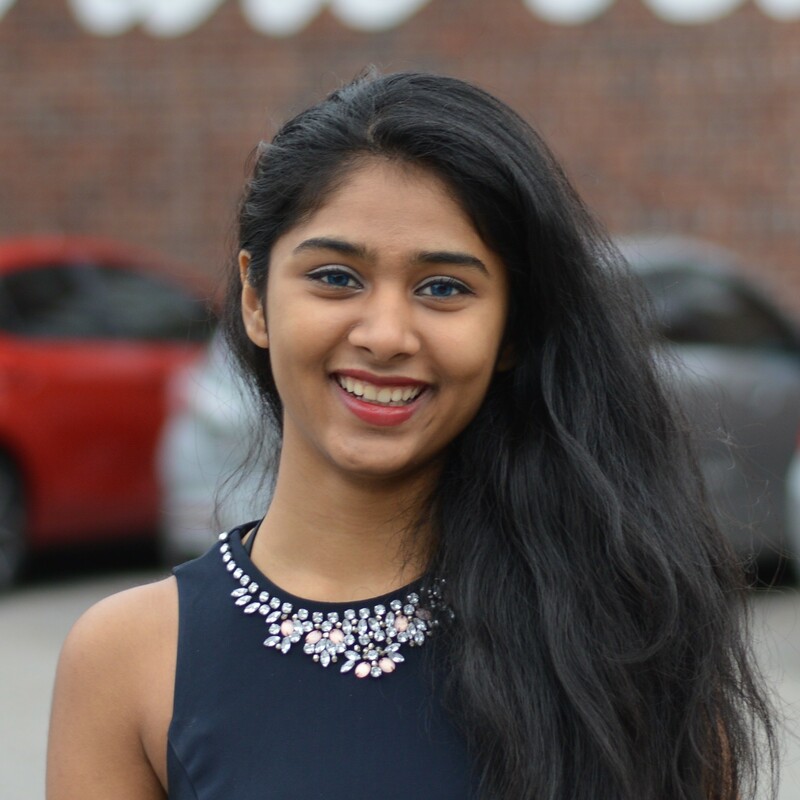 Juhi recently graduated with her bachelor's degree and plans to pursue her graduate education to answer the question “How can we make our cities happier?”.